The rising popularity of corporate gift ideas has created a new realm of creative resources to reach your target audience. An effective way to advertise your business is to think outside the box with the creative placement of gifts. Corporate gift ideas are effectively used for employee incentive programs and to retain your most productive employees. Business promotional items can be used to acquire new clients and retain current customers. You have limitless possibilities in creating your marketing campaign through corporate gift ideas. With everything from custom personalized gifts to specific gifts designed with your logo and an expanded array of business gifts you can’t go wrong. Have fun with your next promotion and be seen! First decide occasions that are suitable for exchanging corporate gift ideas. These may include birthdays, grand openings, meeting important sales goals, moving to a new location, retirement, specific holidays, etc. Consider your relationship to the person you are giving the gift to. Your connection to them may decide the size and nature of the gift. Stumped for corporate gift ideas? 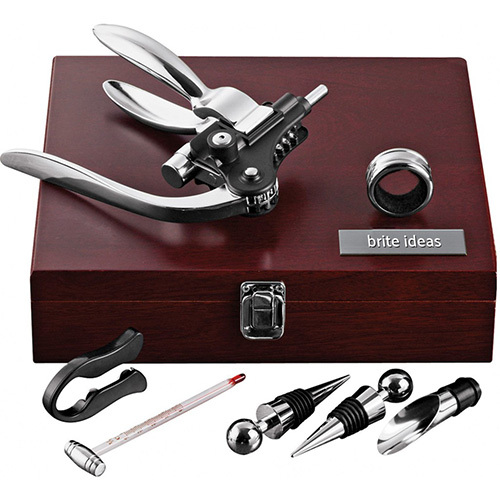 Some terrific gifts include corporate gift baskets containing various useful items. You may for example include custom letterhead or even better, full color stationery as well as a colorful gift basket of useful office equipment, snacks or other personal items a corporate associate may enjoy. How Much Should You Spend? Corporate gift ideas include a wide price range. One way to limit the expense is to set budgets ahead of time. These budgets should apply to all personnel regardless of their position. This will make gift giving easy. You’re in charge of an event. You’re helping plan the annual Christmas party, other holiday event or corporate anniversary celebration. You’re part of the team assigned to organize new ways to entertain or thank business clients and you need corporate gift ideas. We’re here to help you make the event more memorable, especially if you’re limited by a budget, pressed for time or have a deadline. Our website was designed to let you shop by corporate gift ideas category, by the occasion or by price. We pay attention to the details and have in stock items that add color, ambiance, function or are practical ways to corporate gift ideas to thank clients. Whether your employer or business is a Fortune 500 corporation, a professional corporation, religious organization, a dot com start up or an up and coming small business, we’ll suggest and help you find appropriate business gifts, corporate gift idea, and gift cards. When you’re chosen to select or buy customer or employee appreciation gifts, secretary’s day presents or other special occasion items for your boss or employer, we’ll show you an affordable selection of practical, luxurious, elegant or humorous corporate gift ideas. Many of our suggestions for corporate gift ideas can be classically engraved, embroidered or personalized. Sometimes the cost of a gift or what is given is not what’s important. A small souvenir or keepsake, such as a personalized or engraved item, can evoke memories of meeting different people or being a part of a memorable milestone or achievement. Both athletes and attendees of the Olympics cherish and treasure their Olympic pins. We’ll help you make your gifts just as memorable. You’ll appreciate the attention paid to the packaging of our products. Logo, ribbons, paper and bags that are unique and creative ‘gift wrap’ for special occasion corporate gift ideas and treats. You’ll be able to efficiently, quickly and beautifully set the mood, add color, and elegance to your event.